With direct access to real-time client information, the app maps your way to the client’s home. Using the touch screen, you can capture details about room dimensions and check fit by dragging and dropping product into the floor plan of the project. The app also gives visibility into the client’s product selection for the project. Additional details are captured on-site using the iPad’s camera, including photos of the layout and other elements that may determine aspects of the project. 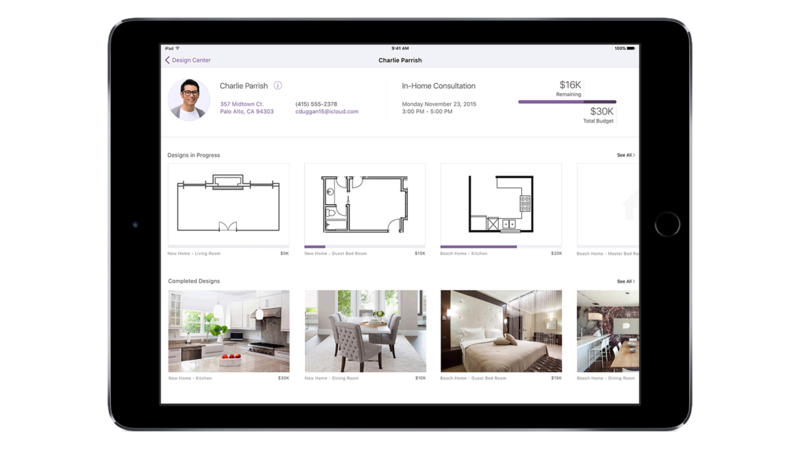 The app captures your client’s ‘liked’ and ‘saved for later’ content giving insight into their vision for the project and helping you suggest items to personalize their space and enhance the project. These real-time client preferences can drive sales and give you great insight into this and future projects. The customer experience is elevated by this service. With access to real-time client data and drag and drop technology, the app consolidates manual information collection that previously took more than a week to complete. You can capture data and review it with the client on the same visit. This functionality saves time, drives higher sales and productivity, and creates a better client experience.